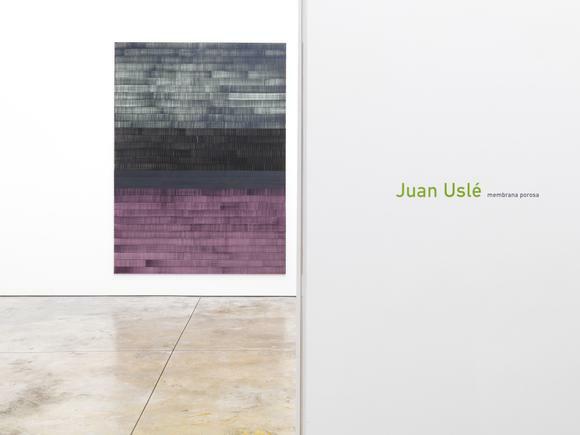 Cheim & Read is pleased to announce Membrana Porosa, an exhibition of recent paintings by Spanish artist Juan Uslé. Uslé has been showing with Cheim & Read since 1997; his last exhibition with the gallery was in 2011. Continuity and discontinuity, light and shadow, material and illusion are the drivers of Juan Uslé’s inimitable body of work. Rhythmic sequences move regularly but not uniformly in bands across the breadth of the canvas—first forward, then backward, then forward again, in gradations from dark to light as the pigment empties from the brush. It is well known to anyone who has followed Uslé’s work that the short, broad brushstrokes comprising these bands are based on the artist’s pulse—in an interview with John Yau for the Brooklyn Rail, he describes his “sequential field or territory of marks” as a “cardiogram.” If so, it is a cardiogram that is ruptured, torn, and tattered. The pulses are the dominant force in many of Uslé’s works, including the large paintings collectively known as Soñe que Revelabas (I Dreamt that You Revealed) which were begun in 1997. The Soñe que Revelabas paintings are individuated not by a numbering system but by parenthetical subtitles named after great rivers of the world—Columbia, Nilo Azul and Ganges. The breaks in these rhythms—the ruptures in the cardiograms—can be harsh, lyrical, or matter-of-fact. They might be as understated as the stripes separating the repeated bands of strokes in Uslé’s small-scale In Kayak paintings, whose subtitles bear the names of lakes. But almost invariably the stripes in these works are mottled with secondary and tertiary colors, with opaque surfaces and dense textures that set up a distinct contrast with the translucent, primarily monochromatic pulses. Often these color-upon-color interventions are painted with a jagged edge, a hint of violence that resembles a piece of snapped, serrated celluloid. As light travels through the filmic skin of the paint—the “porous membrane,” as he calls another family of works—it bounces off the lustrous surface of the gesso, illuminating the image from behind. Juan Uslé has been the subject of major retrospectives at the Es Baluard, Museu d’Art Modern i Contemporani de Palma, Palma de Mallorca (2010); the Centro de Arte Contemporáneo Málaga (2007); S.M.A.K., Ghent, Fundación Botín, Cantabria, Spain, and the Irish Museum of Modern Art, Dublin (2004); the Museo Nacional Centro de Arte Reina Sofía (2003); the Museum Morsbroich, Leverkusen (2002); and the Institut Valencià d’Art Modern and MACBA Museum, Barcelona (1996). He was also included in the 2005 Venice Biennale, Documenta IX (1992), the 1992 Istanbul Biennial, and the 1985 Bienal de São Paulo. In 2014, a major exhibition of Uslé’s Soñe que revelabas series was presented at the Kunstmuseum Bonn. The exhibition, titled Dark Light, traveled to the CGAC Museum, Santiago de Compostela.